Listen to the album while you read this. You are going to love it and you can buy it without even having to get out of your pajamas or do something with your hair. You can skip to Chapter 2 and go straight to the actual review but our lives get tangled up in the music we listen to – at least I hope yours does too because there is no better tangle to be in. So buy the album so you can listen while you read Chapter 1 and be so captivated that by the time you get to the actual review you’ll consider it a conversation between us about an album we’ve both enjoyed. Joni Mitchell was my secret sister and go-to guide for navigating life as a teen and twentysomething woman in the crazy difficult 1970’s. I was taking scary tentative steps into a world being shaken up by a generation of women who were seeing ourselves in a different light and making our lives up as we went along. Joni, Carly, Carole, Laura, Melissa, and others wrote songs would throw little spotlights of clarity on what we were thinking about and going through. As the demands of real life became more invasive we didn’t have time to listen to new songs and the ones we used to love just didn’t define us anymore. They were from another time and another place. 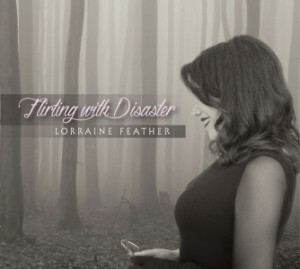 Then I discovered Lorraine Feather. Here is how: I was sitting on the couch in my living room fuming about a guy who had just stood me up. I had managed to find the only person on the planet who thought I was boring and fall flat over heels for him and he, finding something (someone!) better to do pulled a no-show. The mail arrives and Lorraine’s CD is in it. The first song I play has these lyrics: “ He’d never come over, never call. Invariably, I’d wake up fuming about it all, Have screaming arguments with him in my head. Then one morning I looked in the mirror and I said: I can see how upset you are, But it’s very unbecoming. You’ve taken this quite a bit too far, but it’s very unbecoming” That song made me laugh about my whole pathetic plight and whenever I played it on my radio show other women would call and say it did the same for them. I played several songs from the album, women would call and say “yes, that’s me too.” I even did a brief interview with her before corporate dropped the axe on Sunday Morning Jazz. Jump two decades or so. How did that happen? Lose track of music, books, friends, family members, keys, phones. We just lose track. I’m in the library free-ranging through the DVD’s, CDs, and books and there’s Lorraine’s then latest album: Ages. She turned 60 the same time I turned 60 and here were a bunch of songs from the perspective of someone who lived, learned and saw the world from a angle that was true and slightly askew. She found exactly the right words to pin down those experiences, those little weirdness we share mostly in secret. And even more, she celebrated them. None of this “wish I was young again” stuff advertising agencies think we women “of a certain age” are supposed to feel. Instead we get what we really feel – wisdom, humor, irony, life experience, delivered in the voice of of a master wordsmith who inventively combines emotion and experience without stepping anywhere near a cliche. Besides, she wrote one song based on a riff her drummer husband played on a dog bowl, and sang the hold message you get when you call a customer service line. How could you not love that. So here is her latest – Flirting With Disaster – which I could subtitle “a guide to romance for overly literate and obsessively thinky grownups presented by a brilliant lyricist with a voice to die for and the exact lineup of musicians you would pick if you were drafting a Fantasy Jazz Band.” I could spend an hour writing about the title track – a perfect vignette. It starts with a somewhat menacing layered voices underscored by Charlie Bisharats violin and Russell Ferrente’s piano, then her voice almost whispery, creating the mood of an early autumn morning as someone contemplates the lovely and potentially scary possibilities of a new romance. “I’ve run from this since time began, but I used to run much faster. I need you so and here I go, flirting with disaster.” “Feels Like Snow” is just breathtaking. Accompanied by Ferrante sparse arrangement her voice is clear and pure and the lyrics are sheer poetry. Then there is “I’d Be Down With That,” – a percussion driven, jazzed up, whimsical look at how it could or couldn’t happen but it’s worth the try “Unless, the way a motor revs, and then abruptly fails, the simpatico between us goes flying off the rails.” Better the derailment than to not try at all. Right? There are touches of musical theatre here. Her voice is flexible and nuanced – she can whisper, speak rhythmically, hit the high notes pure and clear – whatever is necessary to deliver the lyrics with the most fascinating effect. The melodies take inventive twists and turns, choruses pop up in unusual places, the repetitive pop song structure is blown to shreds in favor of musical monologues and conversations. Take “Wait For It.” Based on Dave Grusin’s “Bossa Baroque” it shifts from classical and pristine to bossa nova and wraps it up with samba percussion, whistles, and a vocalese chorus. “Later” flirts with a Tango rhythm just enough to underscore the anticipation of seeing someone “Later.” Then there is the aptly titled “Disastrous Consequences” – Ferrante reimaged a a classical piece by Gyorgy Ligeti that spins around her voice and Charlie Bisharat’s apprehensive violin line as she sings about the danger of rekindling the flame of a young love gone wrong. Let’s get down to the bottom line. Every song on this album is an album unto itself. You could listen repeatedly and pick up something new in the lyrics, voice, or arrangements every time. Then there are the arrangements, this is musicianship to the highest degree – players so accomplished that they make complicated melodic twists, turns, and shifts sound simple, natural, and intriguing. Pure contemporary jazz played by the best on the scene with knockout solos that catch your ear without distracting from the voice in front. The songs were written and produced with long time collaborators pianist Shelly Berg, Guitarist Eddie Arkin, and Yellowjackets keyboardist Russell Ferrante. Dave Grusin plays and co-produces on several tracks. Grant Geissman and violinist Charles Bisharat are familiar names to cJazz fans and obsessive liner note readers, same with drummer/percussionist Michael Shapiro and Yutaka Yokokura, who put out several albums during the heyday of the GRP label contributes vocals to a track. Bassist Michael Valerio, drummer Gregg Field and percussionist/engineer Carlos Del Rosario round out the band. Think of the Yellowjackets, or Grusin’s albums and film scores. That’s the closest comparison to the way these arrangements work. Think of this album as a multidimentional musical experience because it is one, but most of all think of it as a fun listen with lyrical lines that will jump out and grab you because you’ve been there too. Feather has always written the wisest, funniest, songs about life’s little aggravations (a line Susan Stanberg used in her 2008 interview with Feather), now she has taken on life’s most dangerous fascination. If you are not too jaded, busy or afraid to go there too this album is the best travel guide you could hope for. Want to read the lyrics and the stories behind the songs or just get to know Lorraine? Go here. Want to count the number of basic grammar rules I violated while writing this. Feather’s good friend Miss English has the clues. 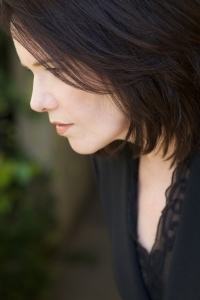 Lorraine Feather’s website is full of awesome content including audio interviews and info on all her albums.